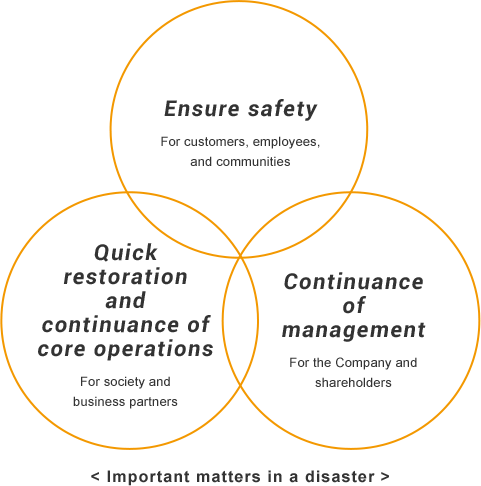 Business Continuity Plan (BCP) - Social Responsibility - MICRONICS JAPAN CO.,LTD. MJC has drawn up a business continuity plan (BCP) to ensure that its core operations can continue to operate or be quickly restored following a large-scale natural disaster or other emergencies. Reinforcing emergency response capabilities not only helps prepare us for the unexpected but also provides a better understanding of the current state of our corporate management, including inventory control and customer management practices. It also provides an opportunity to manage current risks and find solutions. We will continually provide guidance and training and make periodic improvements to ensure that all employees realize that “disasters inevitably occur,” and to deepen their understanding and cooperation related to operation of the BCP.